President Donald Trump meets with Saudi Crown Prince Mohammed bin Salman in the Oval Office of the White House in Washington. Not only has the Trump administration failed to take any concrete action against Saudi Arabia for the murder of journalist Jamal Khashoggi, which experts and members of both parties believe Crown Prince Mohammed bin Salman had a hand in, but the administration has gone out of its way to reward the Saudis. “As you are aware, in order for the United States to engage in major nuclear cooperation with a foreign country, the United States must enter into a so-called “123 agreement.” A 123 agreement can only enter into force after Congress has reviewed it and evaluated whether the agreement meets the nonproliferation standards required by Section 123 of the Atomic Energy Act of 1954. 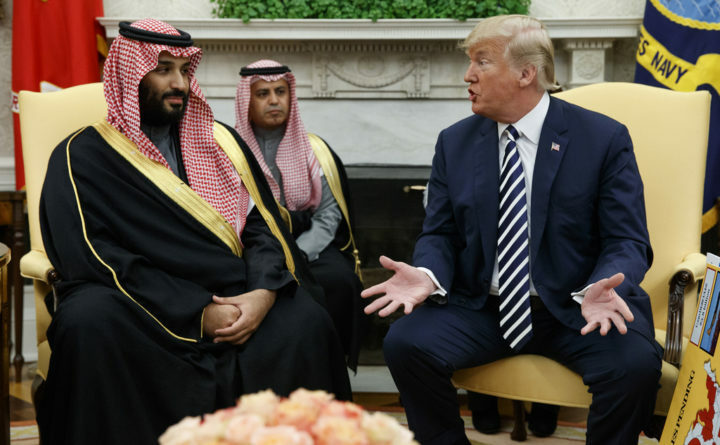 Taking a step back, this issue raises the question of why, in light of Saudi atrocities in the Yemen war and the gruesome murder of Khashoggi, we are even considering this deal. This extraordinary step, seemingly outside the normal processes for nuclear technology channels, would be questionable even if a responsible democracy were the recipient. The Saudi government does not remotely meet that standard. The senators raise a host of questions about how this came to be (e.g., “What are the nonproliferation risks associated with these authorizations? What negotiations has the department engaged in with Saudi Arabia? How did these negotiations lead to the development of the authorizations? What was the interagency process behind the authorizations? How were the approvals coordinated?”). One fears, however, that this policy, like so much else in this administration (including security clearances), is subject to the whims of President Donald Trump and his family members. Whether there are issues at play that affect Jared Kushner and Trump’s financial interests specifically is unknown because we still do not have Trump’s tax returns, nor has he liquidated his holdings, which would have prevented a host of conflicts, receipt of emoluments and, at the very least, the appearance of foreign corruption. Menendez and Rubio are right to demand information on nuclear energy transfers, but this situation is merely one of many concerning the financial secrecy that Trump has been allowed to maintain. Until we know exactly where Trump’s money and credit come from, the earnings he derives from Saudis at his properties and his son-in-law’s interests (recall that four foreign powers let on that they thought Kushner could be manipulated because of his financial situation), we won’t know for sure whether moves such as this stem from terrible foreign policy judgment, personal greed or both.